The Ecoteck Serena freestanding pellet stove uses majolica panels to highlight the sides, top and front of the stove, and to act as heat reservoirs. The majolica panels on the Serena are available in black, bordeaux, parchment and oriental earth, the rest of the stove is in black painted steel. The Serena produces 44,000 btu. and will heat an area of up to 1,800 square feet with a very high 85% overall efficiency. Remote control, GPRS text message control and a wall thermostat are available as options. Window Size 13 in. by 9 in. 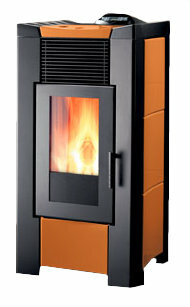 If you would like to leave a review of the Ecoteck Serena pellet stove, please use the form on the contact page.